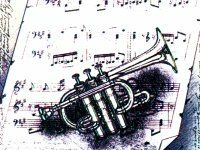 When Maurice André started playing at 12 ½, he played an old cornet. Later at fourteen, studying with Leon Barthelemy he played an Aubertin trumpet. At 18, when he arrived at the Conservatory, Sabarich had him change equipment to a Selmer trumpet. The mouthpiece was a "Fouveau", Quesnon No. 3. Later he switched to a Bach 1 ½ C.
As other great artists, Maurice André has used several brands of trumpets, but mainly Selmer. In all the early recordings one can see that he uses a small Selmer piccolo trumpet. Later in his career, he has used Schilke and Stomvi piccolo trumpets. According to one informant: "in one of the concerts I visited, he also used a Scherzer with rotary valves, this was after his contract with Selmer". On Bb, C, D, Eb trumpet he played Bach 1 ½ C mouthpiece. For the Brandenburg No. 2 and other very high parts he used a Selmer 1 mouthpiece.